Former Auburn standout Lee Ziemba has always worn his Auburn heart on his sleeve. 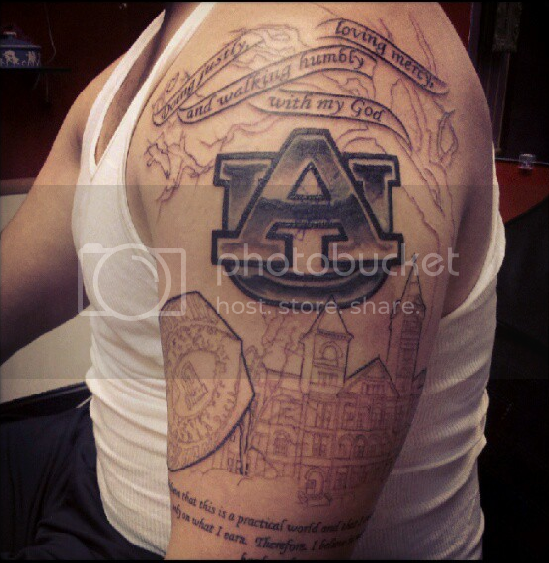 Now the War Eagle Warrior is adding the Auburn Creed, Samford Hall, and pretty much every Auburn icon you can imagine with a half-sleeve Auburn tattoo that is being inked by Leah Farrow, an artist at local tattoo parlor Shenanigans. Farrow started the work Thursday and says that as of Saturday afternoon Ziemba is about nine hours into what will likely be a 30 hour job. In addition to Samford Hall and his national championship ring, Ziemba’s arm will feature likenesses of Jordan-Hare Stadium and even the Toomer’s Oaks. 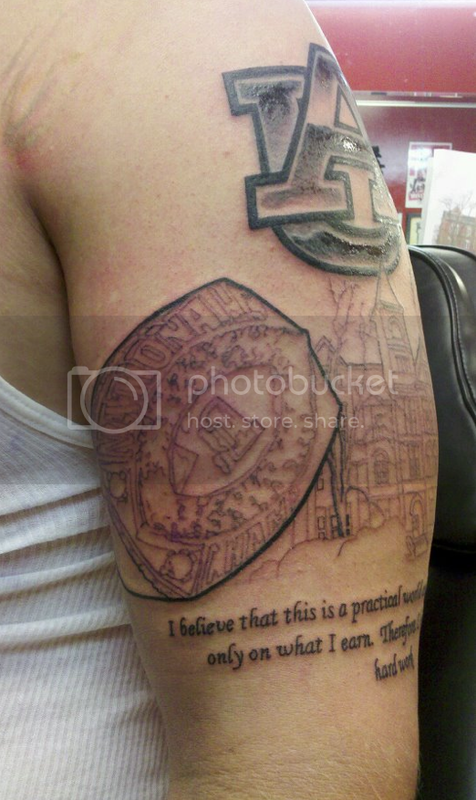 A better view of Lee Ziemba’s national championship ring tattoo. Farrow says Ziemba is planning several more trips to Auburn in the coming weeks in order to have the tattoo finished by the start of the Carolina Panthers’ Training Camp. And don’t think they got a head start with the interlocking AU tattoo Ziemba has sported for a few years. Farrow has also done work on former Auburn players Wes Byrum and Jorrell Bostrom, as well as current players Nosa Eguae and Patrick Miller. UPDATE: You can find new photos of the tattoo here. Related: The Girl with the Draughon Tattoo. He should do Yosemite Sam on the other arm. BEAUTIFUL!!! Can hardly wait for photos of the finished product!!! WAR EAGLE, Lee….War DAMN Eagle!!! Gonna be funny as hell when they get that championship stripped down the road. That is awesome. Love it! wow! Hope he can always keep those guns that big, though. Otherwise some of the tats won’t look as nice.